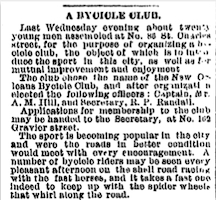 In 1881, the New Orleans Bicycle Club formed in a building at Commercial Street and St. Charles, inside the jewelry and pen shop of A. M. Hill. 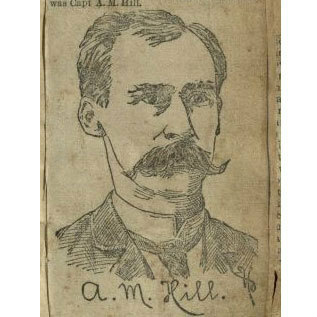 A. M. Hill arrived in New Orleans at nineteen years old, following the end of the Civil War. He had been born in Upstate New York and grew up mainly in Pennsylvania. He attended college in Pittsburgh, at the Iron City Commercial College, which, founded in 1851, was the first business school in the United States. He was only fifteen when he left Pennsylvania for Kentucky, where his brother gave him a position in his jewelry business. By nineteen, Hill sought to strike out on his own. When he arrived in New Orleans in 1869, he started a business making and selling gold pens. Over the next decade and a half, he built his pen and watch business at St. Charles and Commercial Alley, living in an apartment above his shop. When the high wheel, or “penny farthing,” bicycle began to appear in the United States, Hill was an early adopter, riding his first in 1879. That same year, Hill escaped a large fire that destroyed his St. Charles Street business and his upstairs apartment. Hill was an active participant in amateur athletics. A member of the Young Men’s Gymnastic Club, he joined the Amateur Regatta in 1879. He was generous as well. His many donations included “plated ware” for a Christmas dinner at an orphanage in 1880 and a valuable trophy for a sharpshooting competition in 1882. 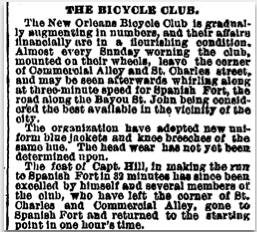 The first meeting of the New Orleans Bicycle Club was held on April 30, 1881, at Hill’s Commercial Street business. There were twenty members, and Hill was elected captain. Thenceforth, Hill was referred to in the papers as “Captain” Hill, even after he was no longer the captain of the club. His fortunes were looking up, as he was elected to membership in the Produce Exchange, an influential businessmen’s group. One year later, he purchased the jewelry store of E. A. Tyler at St. Charles and Canal Street; Hill would eventually turn it into one of the most successful jewelry businesses in the South. Pierre Lallemant, Inventor of the "Boneshaker" Bicycle: Lallemant sits atop a high wheel bicycle in 1886. Public Domain, Wikimedia Commons. 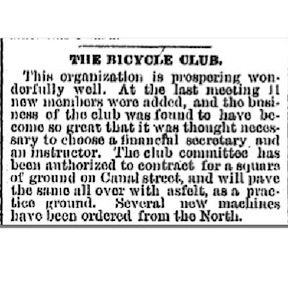 Lacar Musgrove, “Founding of New Orleans Bicycle Club, 1881,” New Orleans Historical, accessed April 24, 2019, https://neworleanshistorical.org/items/show/501.